I've got a G9 layout in the planning for the next train show (mid October). But first I'm going to need some G9 stock. So here is my first (and somewhat lazy) attempt at a G9 build. First a Kato chassis. This is about the same length as the 4 wheel chassis, except I got it because I thought it would be better having twice the pick ups and driving wheels. However after dropping it on the floor and it breaking apart I found out it only drives on one bogie. The funnel still needs extending and other features adding. But it’s a start. Last edited by Glen A on Mon Oct 21, 2013 5:45 pm, edited 1 time in total. Glen A wrote: But it’s a start. And a very nice start it is too. I rather think Wallace is finding it a bit cosy. Have you been tucking into a few too many servings of cheese and crackers lad? I'm surprised that Wallace was happy to have his torso mangled. 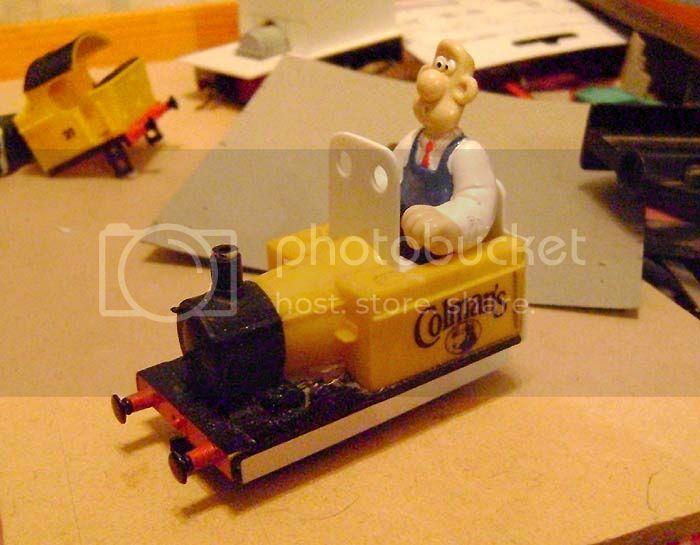 The Loco logo needs changing to Wensleydale methinks as Wallace never was a fan of mustard. Looking forward Glen to see how this develops. Looking good so far. Devilishly simple but very effective. Alas, I find that the Kato short bogie chassis actually produces more wheel spin than the four wheel shortie. And as for getting the darned thing on the track with the extra overhang of the new body.....can drive you to distraction unless you get one of those cheap plastic re-railer things. 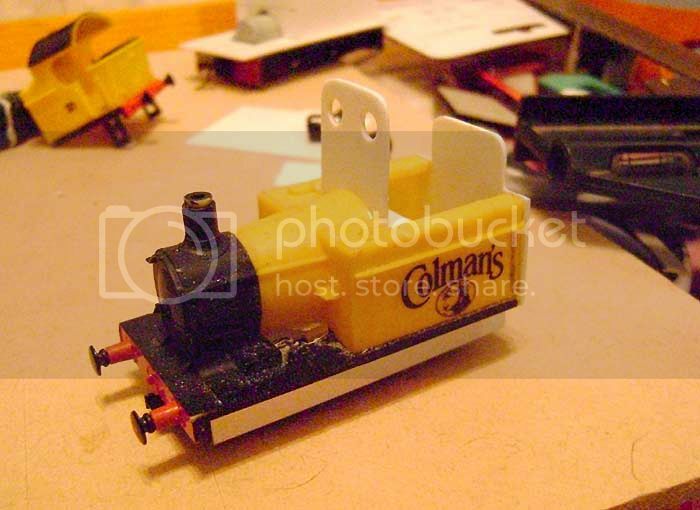 On the positive side I think that pick-up is better on these, and the dimensions mean that it's really easy to build your body such as it will take either the bogie or the 4 wheel chassis. Good to see another Gnine project being started. I prefer to use the Kato 4 wheel chassis as I think it runs better, but they are both good to use for Gnine. Good luck with the project. 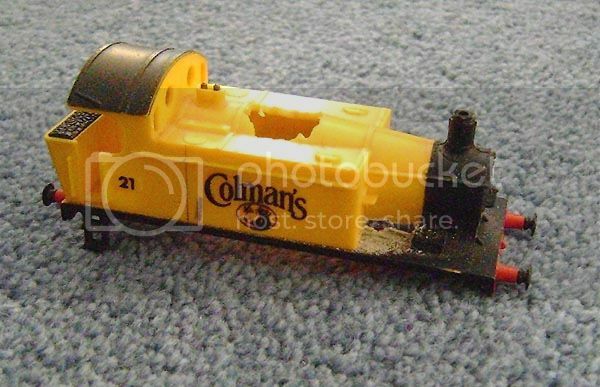 I asked the question elsewhere, but no-one else seems to have used this bogie chassis. It doesn't bother me that it only powers on one bogie as long as it picks u on both. But the question I have is how tight a curve will it go round. Plaza Japan state this with some but not this one. Narrow gauge Francophile interested in 1m, 60cm,50cm , 40cm and smaller gauges . Build in scales from 1/6th to 1/24th. Also 1/32nd and 1/35th using 16.5mm track to represent 50cm and 60cm gauges. 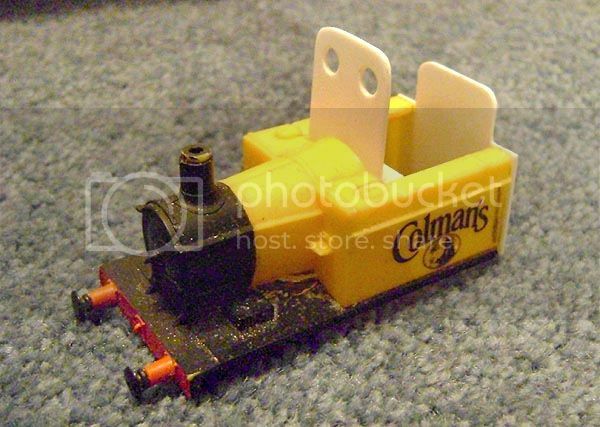 I have one of these and it goes round the 5" radius curve on my Buttermere Mining layout. Using DCC since 1997 wherever I can! Very nice, as a child I had one of the donor locos in GW finish, the smokebox always reminded me of Fairbourne's 'Katie' (the second) as a youngster! 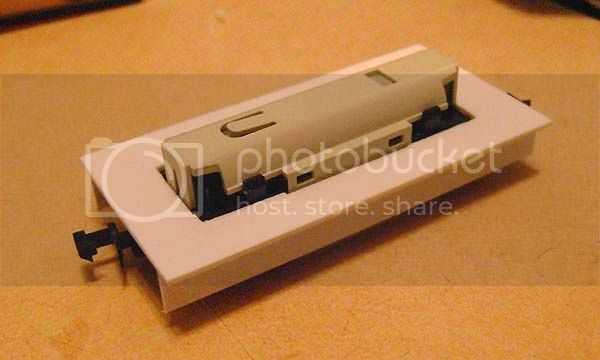 I'd be for removing the moulded on handrails, even if this is just a 'quicky' project, it will improve the model no end. Nice little project. Very effective. 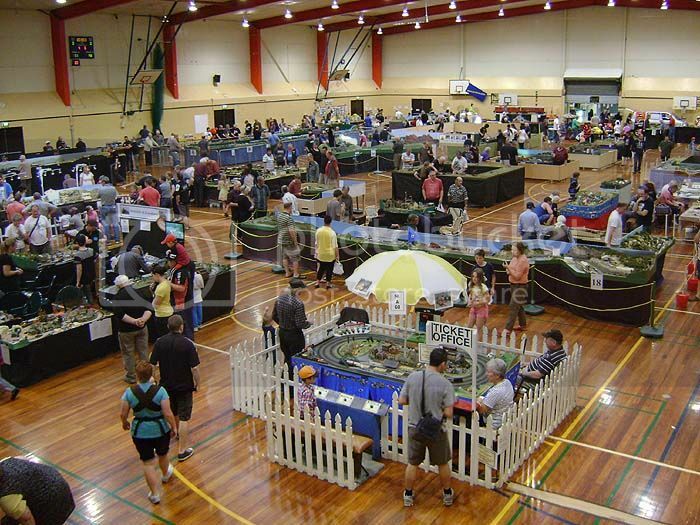 It will be around for the next 36 hours at the Big Model Train show in Christchurch, New Zealand. Then it will be taken apart again. I put more details on it last night after taking these photos. I'll get some more photos today. Got its own mode of transport to and from the show! How far do you have to push it from home to the show?! Keep it on the Short and Gnarrow! 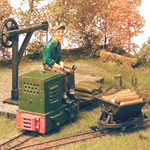 The Lea Bailey Light Railway - follow us on facebook..
How far do you have to push it from home to the show?! It went down on the trailer in pieces, with my two other layouts. Got built outside the show in a few minutes, then wheeled in the door. 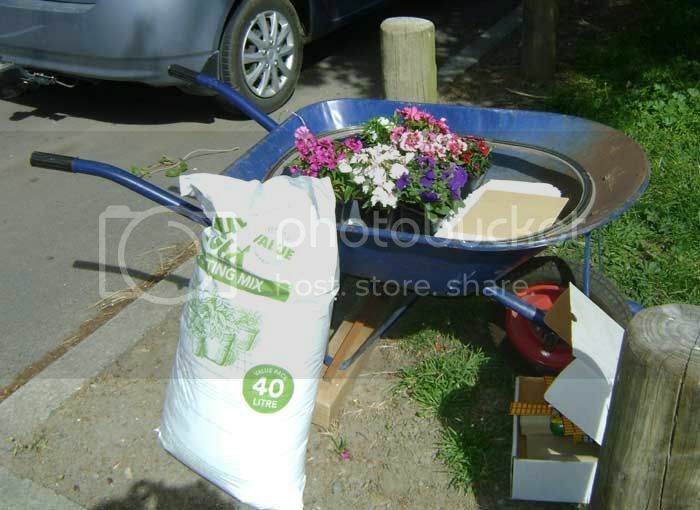 Will get 'unmade' after the show tomorrow (the potting mix will probably get donated (dumped) into the nearest garden in the park by the hall), and it will come home in pieces. 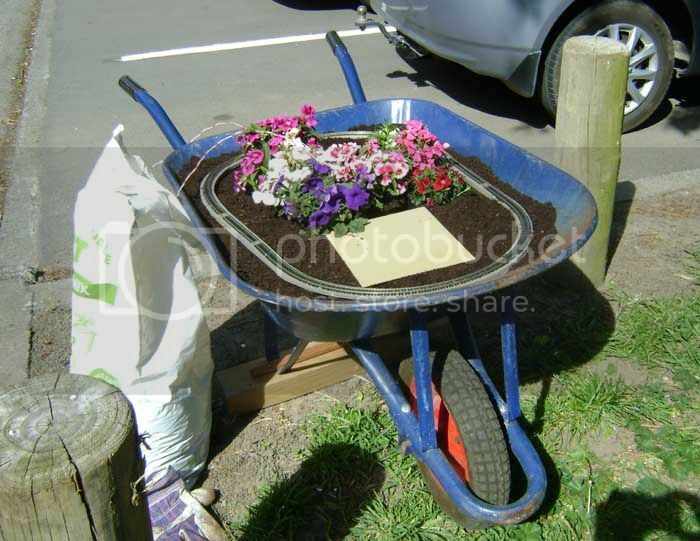 The flowers will be recycled into our garden at home. 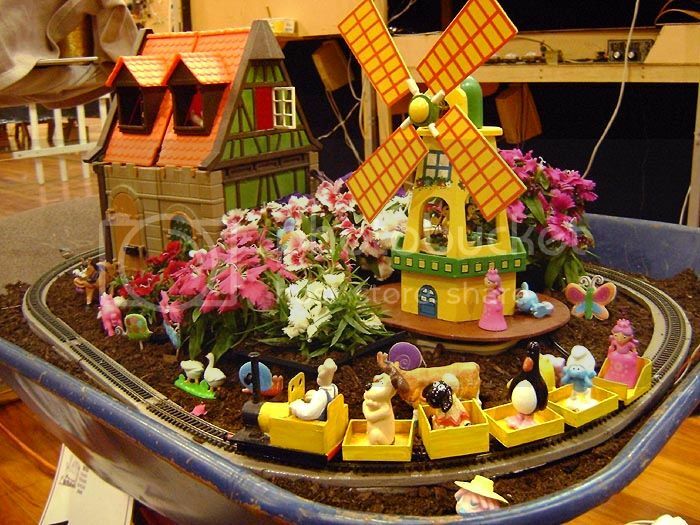 The windmill sails turned, and the musical ladybugs inside it went around too. 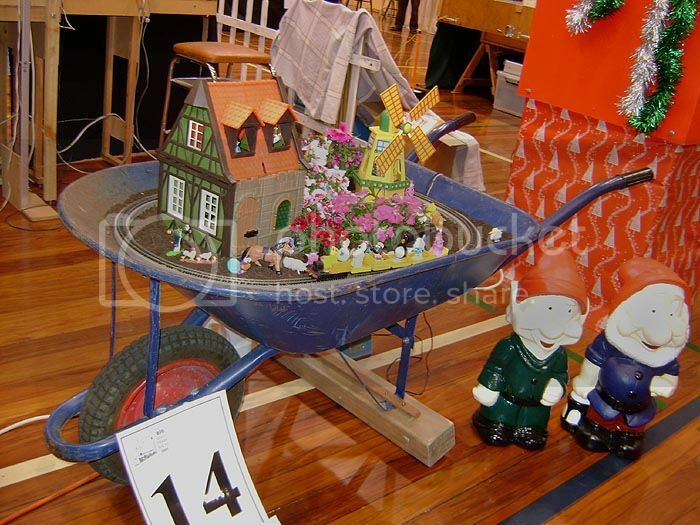 Gnomes and my Christmas layout beside them. The hall before it filled up with people. Great Glen, I'm sure the kids loved it. You have with this layout the makings of a Gnew Challengne. Construct & run the layout at the exhibition! 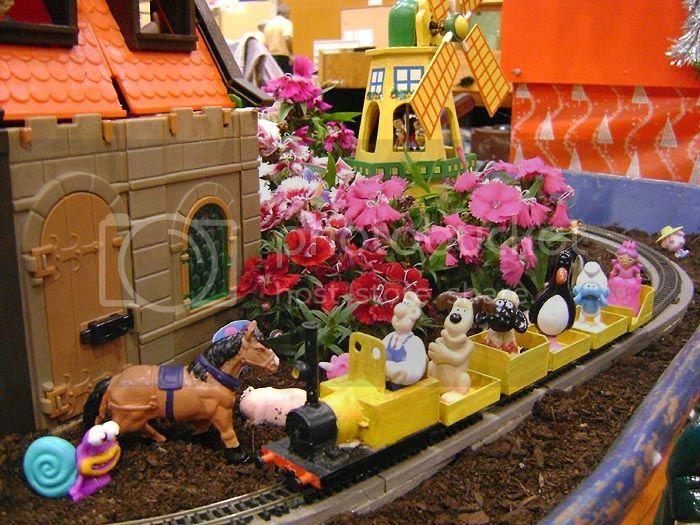 5 people even voted it the best layout in the show (and I didn't even pay them! ). The public favourite was the Stamping Ground, which has now won 4 times in a row and will probably take a rest next year. 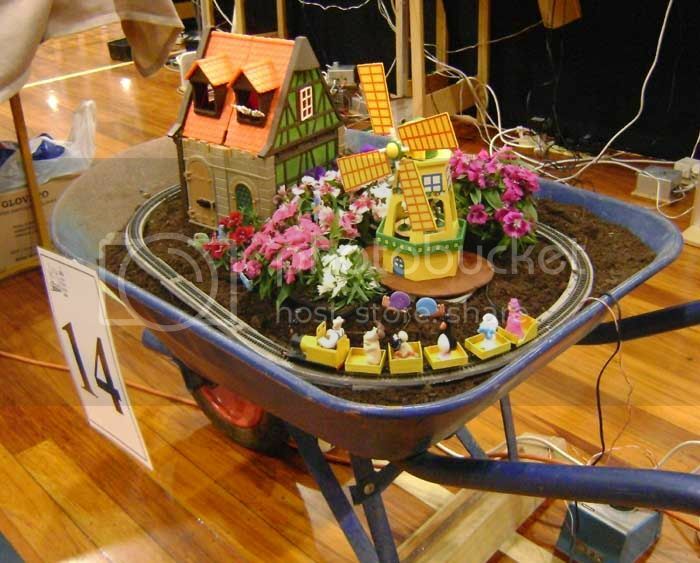 Its now the most popular layout in the history of the Christchurch show as two others layouts have also won it three times each. Last edited by Glen A on Tue Oct 22, 2013 8:14 am, edited 1 time in total. Glen A wrote: The public favourite was the Stamping Ground, which has now won 4 times in a row and will probably take a rest next year. Its now the most popular layout overall as two others layouts have also won it three times each. I have ? Glen, first congratulations; second were the wins at the same show over the 4 year period which is what your comment suggests? If Yes then this is where, in the UK, it couldn't happen. Very unusual for layout to appear at same show two years running let alone 4! If a layout is well received it might be invited back after a couple of years break. At my Club that also applies to our Club Layouts which, of course, do not incur any expenses. Regarding Gerry's comment on getting invites back remember that the UK has a lot bigger base of modelers to call on than either NZ (or Aus for that matter) and so it is a lot easier to get new layouts. Also the tyranny of distance is not such a problem. Melbourne to Brisbane is roughly about London to Sophia, Bulgaria or about 1800km one way. And I have done that trip (and beyond), several times. I might be daft but not stupid. Sorry for not making my comment clear. I was only referring to the layouts that have been voted the most popular over the 26+ years that the show in Christchurch has been running.